The Blue Market has a rich history and has been the hub of the community for over 100 years. In the old times local people used the expression down the Blue to indicate going to do their shopping; that saying is still prevalent today when people visit the Blue Market and shops on Southwark Park road. 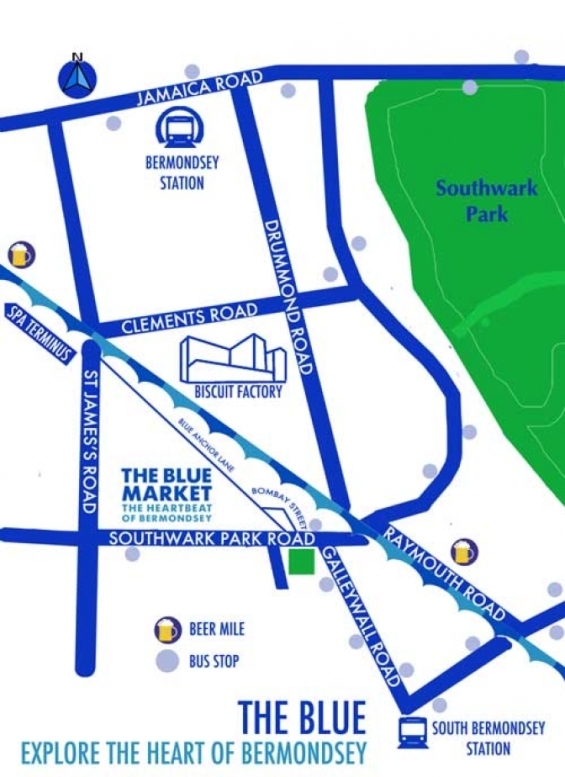 Blue Market Saturdays is perfect for visiting the heart of Bermondsey. The weekly mixture of local traders, new start ups and community stalls in addition to our regular market during the week. There are many cafes, pubs and shops and only we are only a few minutes stroll from the Bermondsey Beer Mile and Spa Terminus. We believe that it is important to give new opportunities to new traders, especially those who are launching new products or who have never traded before. The Community Opportunity marquee and stalls provides a platform for new start-ups and pop-up enterprises to trade in the market. 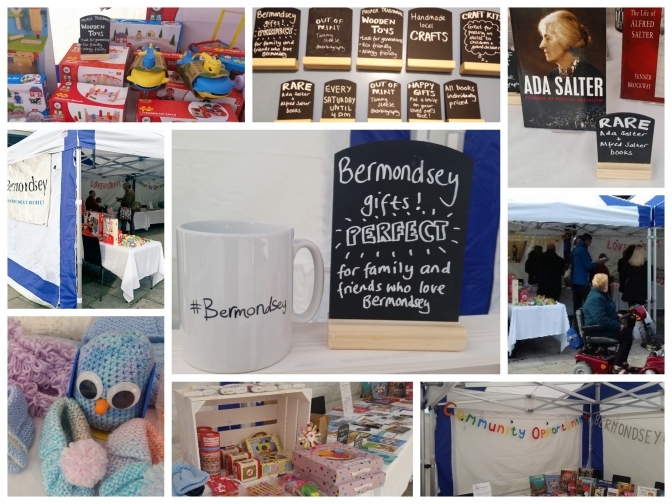 This initiative has been made possible with the support of Blue Bermondsey BID in partnership with Big Local Works, working with Southwark Council’s markets team and forms part of our longer term strategy for invigorating our historic market to better meet the needs of our changing retail landscape and create more employment opportunities for local people. If you are interested in having a stall on the market, pop along and see Emma at the Community Opportunity marquee. We are currently seeking new traders to the market to sell Monday to Fridays in addition to our special market event on Saturday. 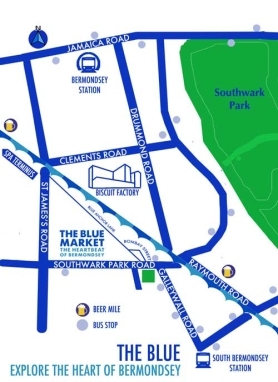 The Blue Market is only 10 minutes walk from Bermondsey underground and South Bermondsey train stations and served by buses 1, 381 and P12 plus on-street parking available. We are pleased to announce plans to improve the Blue Market in 2018. 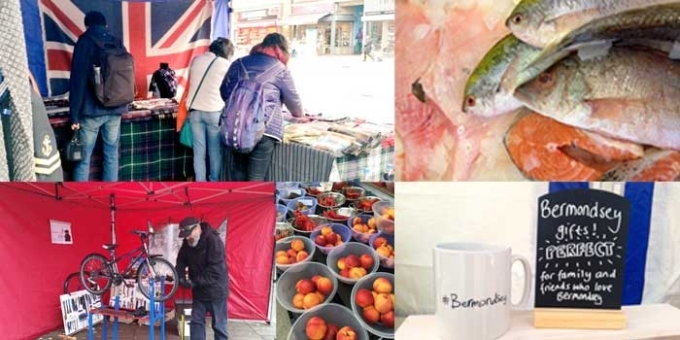 Funding has be awarded from Southwark Council's High Street Challenge initiative to develope a strategy and vision and we are working closely with the Council markets team, local stakeholders and community organisations, with the mission to create a vibrant hub for visitors, local residents, businesses and new traders. We will be updating this website in the near future to reflect the changes and developments on the Blue Market that will be happening in 2018.